You are receiving this email because you know me or you have emailed me or been copied into an email sent to me about local community, political or environmental matters. It is not my intention to spam anyone. If you do not wish to receive these newsletters please unsubscribe using the button at the bottom of the page. All opinions, unless otherwise stated, are my own. There is a proposed new development at St Mary’s Lodge. We are still some way from an application but from the amount of work done this appears to be a serious attempt to develop the site and one which is seeking local approval. It is being done by the Vishnitz community which are the current owners of the site. 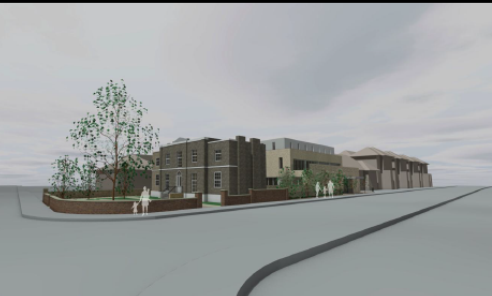 The site is now smaller than the site for a previous application which included part of the Tora Etz Chaim (TEC) synagogue adjacent on Lordship Road. There is still existing planning approval for a new synagogue on that site although no building has commenced. The plan, although superior in design, follows the most recent planning application in restoring (and enlarging) the Lodge with a separate reaching to the far (Western) end of the site adjacent to the recently converted “nineteen thirties” houses. The problem with the site is the size of the development which is very large to fit into the size of the site available. There are also transport implications. Buses would have to enter and exit the site very near the Lordship Park/Road intersection. The Design and Access statement and the transport document would be good starts for approaching the development. As is well known, the site’s use is restricted to Education or possibly community use and was sold by the Council at an undervalue because of that covenant. However, speaking from a conservation viewpoint, local groups, including the Conservation Area Advisory Committee, have suggested that the community could negotiate an alternative educational provision in return for allowing the site to be developed for residential purposes. The latter has more chance of ending up with an acceptable scheme to preserve and enhance the lodge. On Friday the 24th I attended a meeting on the new Sustainable Transformation Plans at the Guildhall. These developments are complicated and my understanding of them is not perfect so this is only my own take on the matter. When the Coalition government “reformed” the NHS it split it down into localised units the Clinical Commissioning Groups (CCG) that were comprised of primary care representatives (GPs) and which commissioned secondary care services (Hospitals, Mental Health Trusts etc.) over small areas, in our case the City and Hackney. Its aims are to implement the five year forward view. So this is the framework. The reversal to some degree of localisation to achieve economies. Possibly justifying critics who saw localisation as uneconomic and merely as making it easier for parts of the NHS to be privatised. The integration of Health and Social Services. This may achieve better ways of working but also may mean plundering of the health budget to prop up failing social services provision. Promoting prevention and self-management of chronic conditions as priorities in the approach to health care. While some of this is due to technological improvements and is already upon us, other aspects will only produce results in the long term. While achieving better results is an obvious aim and should not be dismissed cynically, cost savings are a major driving force. Those in my group all agreed that if the government could be more open about this they would be better trusted. And if the economics of the NHS were more transparent people would be better able to make decisions on how to fund it. To some extent Hackney is ahead of the pack as our current Devolution pilot already involves the integration of health and social care with an “Integrated Commissioning Board”. How will this help? Well, it may be that the economies hoped for will be limited but there will be improvements in communication between GPs and other health providers to improve home care. But one example of beneficial economic outcome might be reversing the recent closure of the intermediate care centre at Median Road. This is a rehabilitation facility for those leaving hospital. Presently there is a conflict between Social Care which would like (from the point of view of budgets) patients to stay in hospital until they are able to return home independently and Hospital administrators who need to clear beds. If there is one budget for both facilities this conflict is better able to be resolved to the benefit of the patient. What’s Happening with Wilmer Place? Most people know that the Sainsbury’s development at Wilmer Place has been withdrawn. And with the cladding of the “Shed” to provide accommodation, that scheme is now pretty well dead. Credit for this lies with local group “Stokey Local” and campaigner Nick Perry who organised the legal challenge with local barristers who acted “pro-bono”. Although the legal challenge failed it held the site in contention for long enough for the momentum of the scheme to run out. (It remains to be seen if this approach can also succeed with certain policies on a National level). Those who remember the controversy over the two antagonistic “neighbourhood forum”s attempted in Stamford Hill will nkow that the Council refused both forums. Over the last 18 months the community in Stamford Hill have come together to identify issues and challenges for their neighbourhoods. Key issues for the community have been identified through community engagement and other evidence gathering which sets out a proposed vision for Stamford Hill. A number of primary needs have been identified. These needs include: maximising the supply of large family homes, improving public space and the public realm, providing new schools and community facilities and expanding the local economy in Stamford Hill. Hackney’s Cabinet have now approved a report which sets out a vision and objectives for the future of Stamford Hill. The report called ‘Towards a Stamford Hill Plan’ also includes draft alternative policy options, for consultation, which will seek to address these issues and will form the basis of an Area Action Plan for Stamford Hill. The Stamford Hill Plan will be a key strategic planning document which will establish a vision and planning policies to direct and guide development in Stamford Hill up to 2033. The Plan is critical in ensuring that the Council meets the needs of the diverse communities in Stamford Hill. Meeting community needs, education, health social and leisure. The Planning team have carried out extensive consultation with the community of Stamford Hill. Over 500 interviews took place with local people and nine topic based community workshops were held in Stamford Hill between summer 2015 and spring 2016. More events are planned during February and March as part of the consultation on the draft plan. The Old Coal House, now a cafe on “Woodberry Wetlands” (The East Reservoir) has won a community planning award.